Looking for Laguna Beach bee removal? Bees love Laguna Beach. With an abundance of water, trees, and vegetation, there are so many places for bees to build hives. Unfortunately, these hives can cause property damage if not resolved quickly. 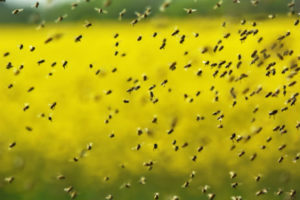 Watching the bee flight patterns can tell a lot about a possible infestation. The manner in which bees fly around is significant. Most noteworthy, there are only two kinds of flight patterns. First of all, bees who are just aimlessly flying around without a sense of purpose are either scout bees looking for a place to build a hive or just field bees collecting pollen and food. These bees tend to be pretty docile. Without a hive to protect, foraging bees are less of a danger to humans and small animals. Click here to see our “Bee Safety Tips” page for more information about bees and your safety. In contrast, the other flight pattern looks more like a busy airport. Bees darting in and out of a specific location is a great indication there is a hive present. If a beehive is present, bees become very territorial and will chase off any perceived intruder. If the hive is that of European honeybees, they will only send out a couple hundred bees to chase of a threat. Even more aggressive than European honeybees, Africanized honeybees will send out thousands of bees to “eliminate” any trespassers. Consequently, Africanized bees are capable of causing serious injury and possibly killing small animals. Lastly, there is no way to tell if the bee infestation you may have is of European or Africanized bees, so please call us to arrange for your bee removal. Regardless of flight patterns, The Bee Man offers professional bee removal services on a 24/7 basis. Do not attempt to remove bees yourself. Call us for a free quote. Finally, if you need any Laguna Beach bee removal, please contact The Bee Man at (949) 455-0123 before any property damage occurs.